What would YOU do if your most loved book character up and died on you? You'd throw a funeral for him. And thus we did for our friend James Gatsby, also known as The Great Gatsby himself. (***Spoiler alert. ***) Wait, was I supposed to give that info before he died? I get so confused sometimes. My bad. 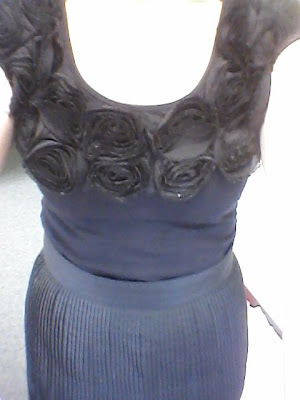 Such an occassion required appropriate dress. Next step: get a body. Then some flowers. Maybe a couple of pictures of our old buddy. 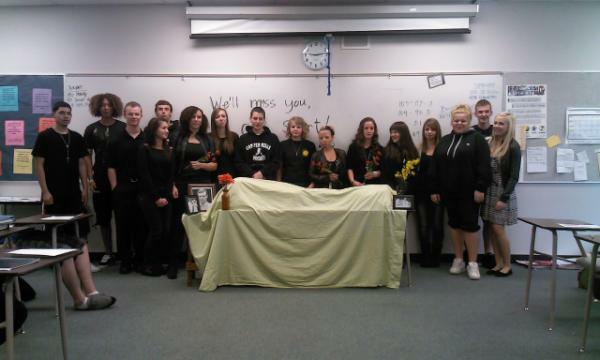 Below is my class paying our respects to the old man. They all had to contribute to the funeral, giving speeches, writing letters, reading obituaries, etc. You better believe they knocked the ball out of the park because that is just the type of students they are. There is a teacher somewhere in this mix. Can you find her? 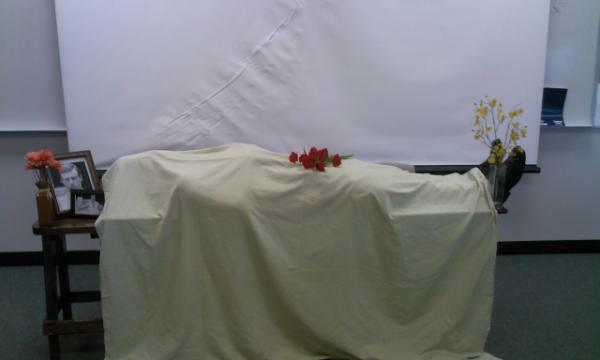 At noon I had the brilliant idea to hide a kid under the sheet to scare the students when they came back from lunch. 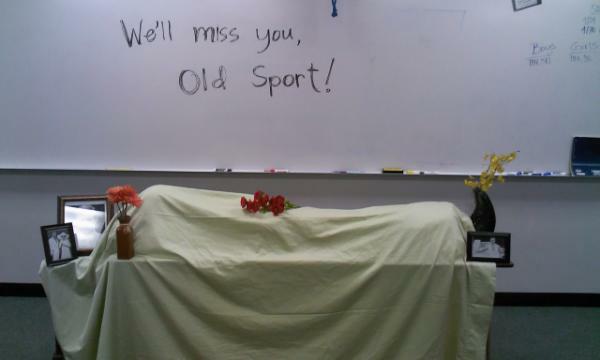 You might think I'm mean to always be pranking my students like this, but they deserve it, do you hear me? THEY DESERVE IT FOR THE GRIEF THEY GIVE ME! There is a real kid under this desk now. Can you tell the different from the earlier picture? These young kids are just too easily fooled, can you blame me? Now answer me this. Is there anything better than watching a teacher scare the living daylights out of a class of 40 punk teenagers? My Mama is a teacher & she would appreciate this for sure! Good one! Oh my... Hilarious! Love it! 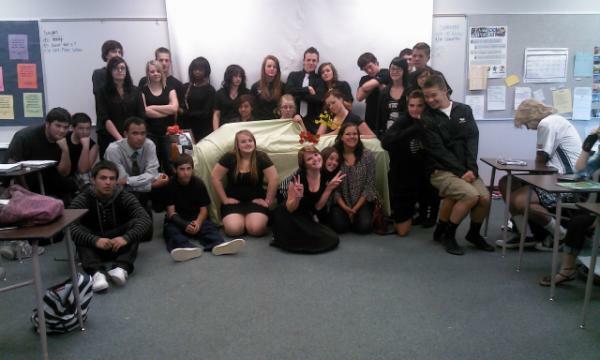 I love that you had a funeral for Gatsby! I'm pretty sure you would have been my favorite teacher for that. In high school, we had a birthday party for Frankenstein, which was much fun. The only thing I love more is that you pranked your students. Pretty sure I would have peed my pants. I had a teacher in high school that did those sorts of things. I've forgotten a good hunk of high school, but that, I remember, twenty some years later. Way to go. You are all kinds of awesome! Love this post!! Even though I knew that someone was under the sheet, I still got scared when they jumped up. Those kids wouldn't have known what hit them! I hope my Kid is lucky enough to get a teacher in high school is still has fun with their job. ha ha. this is hilarious! Rock on girlfriend! This is SO awesome! HI.LAR.IOUS!! This was fantastic. Thank you for brightening my day. And I can say from my previous experience as a teenager, they probably deserved it! Oh Bon, you're funny! Me gusta tu creatividad en tus clases. Sos capisima! So funny Bonnie! I love this whole idea! Hilarious! You are a good teacher! OMG great idea and so funny!